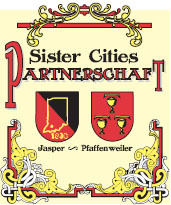 The Jasper Partnership Commission with assistance from members of the German Club and Sister Cities of Jasper, Inc. planned the 20 th Anniversary Celebration of the Jasper-Pfaffenweiler Sister City Partnership. 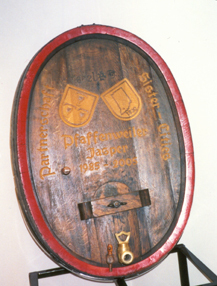 The Partnership Commission serves as the official liaison between the City of Jasper and Pfaffenweiler, Germany, their Sister City. Fifty guests from Germany arrived via train at the Train Depot in Jasper on Tuesday, August 2 nd. The guests were greeted by their host families and friends. A welcoming ceremony took place and the guests were shown their names on bricks purchased from ROJAC. These bricks are in the courtyard near the Train Depot. The guests from Germany stayed in the homes of area family and friends. On Wednesday morning, a Partnership Meeting was held in the Pfaffenweiler Room at Jasper City Hall. Attending were both Mayors, members of the Partnership Commission , and members of the Pfaffenweiler and Jasper communities. Both Mayors shared information on the happenings within their communities. Attendees found that there are similar challenges in both communities. 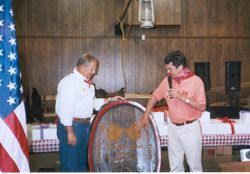 The dinner and program celebrating the 20 th Anniversary was held on Wednesday, August 3 rd, at the Jasper Outdoor Recreation Club. 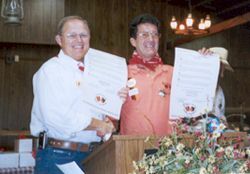 A dinner was served followed by a Program with speeches, signing of the 20 Year Partnership document by Mayor William Schmitt and Pfaffenweiler Mayor Fritz Gutgsell, and presentation of gifts. Mayor Gutgsell was also presented with the “The City of Jasper German Heritage Leadership Award”, from the City of Jasper in recognition of “23 years of Leadership in the Promotion of the Jasper/Pfaffenweiler Partnership”. 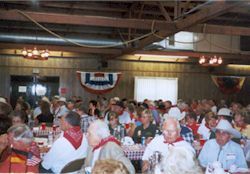 The dinner and program was attended by 200 people. The Strassenfest began on Thursday, August 4 th. Pfaffenweiler Mayor Fritz Gutgsell and his wife, Brigitte, and this year’s Grand Marshals, Franz and Baerbel Hilger of Pfaffenweiler, were a part of the opening ceremonies. The Gutgsells and the Hilgers have visited Jasper many times. A special feature of the Strassenfest were the Alpine Horn Blowers from Pfaffenweiler. This quartet performed the same mountain songs which entertain the citizens of Pfaffenweiler and at other festivals in Germany. The Alpine Horn Blowers were featured on the German Club Float in the Strassenfest parade and members of Pfaffenweiler’s Brass Band were on St. Joseph’s Catholic Church Float. The visitors from Germany took part in the Eckert Mill dedication along the Patoka River on Saturday, August 6 th. They brought with them from Pfaffenweiler a carved stone to be used in the reconstruction of the Mill. On Tuesday, as part of the departing ceremonies, the Baumann Cross, located in the south lawn at St. Joseph’s Catholic Church, was rededicated. The guests from Pfaffenweiler departed Jasper on Tuesday, August 9 th. 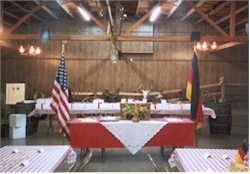 We invite you to visit the City of Jasper, Jasper Indiana Chamber of Commerce, the Jasper Strassenfest and the Dubois County Visitors Center & Tourism Commission web sites along with the web site of our Sister City, Pfaffenweiler, Germany. The Jasper DeutscherVerein and Sister Cities of Jasper, Inc. gratefully acknowledges the Dubois County Community Foundation, the Dubois County Tourism Commission, and Germany in US for their support of this web site.